Expectations - whether we choose to acknowledge them or make believe we're above them - we all carry them into our seats at the multiplex. Everyone wants a winner - why else would you plunk down twelve bucks and commit two hours of your life to the effort? And when the name Steven Spielberg is attached to a project, those expectations are naturally monstrous - this is the man that taught us the waters off Long Island feature more than mackerel, Indiana isn't just the 19th state and ticking off a psychopathic truck driver can result in colossal carnage. When Spielberg's name was attached to adapt the classic children's book and hugely successful stage show 'War Horse', nothing short of a masterpiece was the expectation. And while Spielberg certainly delivered an epic - its epic length is the one thing you're guaranteed to take from the experience. 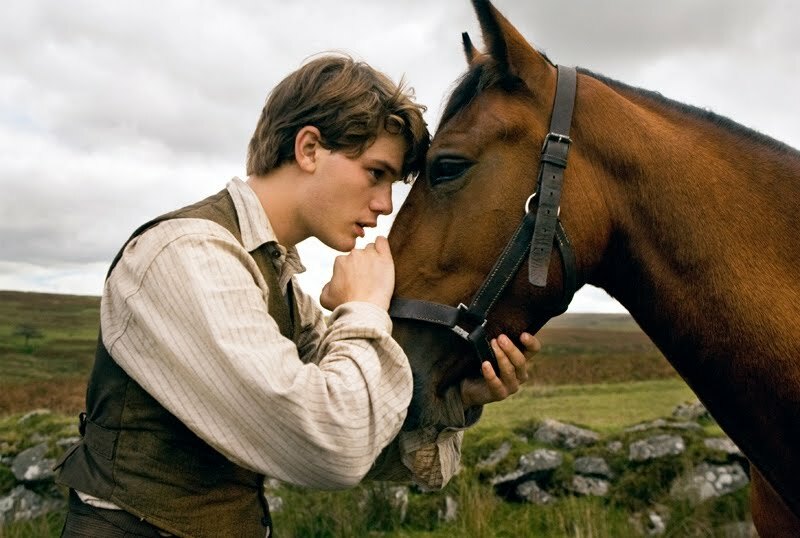 Set on the eve of World War I in a gloriously picturesque southwest England (ready the cinematography Oscar), 'War Horse' is the story of a boy, Albert Narracott (Jeremy Irvine, a dead-ringer for a young Tom Brady) and his beloved pet horse Joey - AKA 'Lassie' with a saddle. With the war commencing, Joey is sold off to the British calvary to pay past due bills by Albert's father, Ted (Peter Mullan), a tortured soul courtesy of his own experiences with battle. Thus begins Joey the horse's agonizingly tedious odyssey across the landscape of France and the teetering on melodramatic meetings with those affected by the warfare. The scope of the battle scenes is exactly what you'd expect from Spielberg - sensationally sweeping. From the charge of hundreds of horses on German command to the bombardment of British positions in what could serve as one of the Battles of the Marne - 'War Horse' drops you right in the middle of war in vividly visceral fashion. It's the melodramaticism that lessens the impact of the events - a horse bound in barbed wire creating a cease fire? It may have worked on the page and stage but on screen it comes off as well - corny. While Spielberg has clearly given his all to bring the book to life, 'War Horse' as a story is too melodramatically flawed to allow for the emotional reaction Spielberg makes every effort to evoke. It's a 30-minutes too long, wannabe classic that will ultimately be shelved in the works of Spielberg ahead of 'War of the Worlds' but well behind 'Saving Private Ryan'.